"A chevron engrailed gules between two pigeons in chief and an uprooted oak tree in base proper. A silver cross flory on an azure chief between two open books also proper binding and clasps of the first." The crest embodies the legend of the discovery of the mineral waters to which Cheltenham owed its rise as an island watering place. The legend tells us that attention was drawn to the waters by the flocks of pigeons resorting to a saline spring which rose to the surface. The oak tree and sprays are symbolic of the avenue of trees in the public promenades and streets for which Cheltenham is also celebrated. The coat in the arms is that of Edward the Confessor, who once owned the manor of Cheltenham. The manor is consequently "Terra Regis" and of "Ancient Demesne." 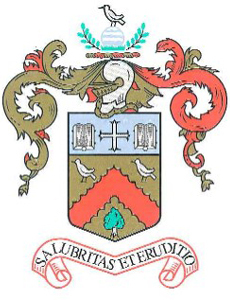 The motto "Salubritas et Eruditio"
The open book and the "Eruditio" in the Motto are emblematic of the educational advantages of Cheltenham in the ancient foundation of Pate's Grammar School; the Cheltenham College; the Ladies' College; St. Paul's College; St. Mary's College; the Dean Close Memorial School and other educational establishments. The word "Salubritas" in the motto is indicative of the high repute in which Cheltenham is held as a health resort.